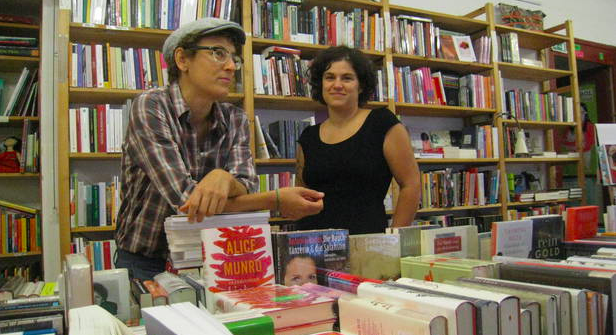 For 30 years there was a feminist bookshop in Vienna called Frauenzimmer. Literally translated into English the name means Ladies Room, but the real meaning is a little bit more complex. In German the word Frauenzimmer doesn’t have anything to do with ladies’ restrooms, but the term is slightly pejorative. Calling someone a Frauenzimmer is a bit like calling them a wench or even a bimbo, so the original founders were reappropriating a term with negative connotations, much like we have with our current name ChickLit. We found our shop’s name in a book of booktrade expressions. We’d both spent most of our careers outside the booktrade, and we were really annoyed by the use of the moniker ‘ChickLit’ to describe ‘women’s literature’. We believe that any books can be women’s books, so we decided to play around with the term. That’s why our slogan is ChickLit: Feminist Entertainment. The original shop was founded in the wake of the new feminist movement of the 1970s. Over the years there were lots of changes in personnel and it located to larger premises at one point, but the shop became an important focus of the feminist movement in Vienna. Along with Jenny, who’s now a co-owner of the shop with me, we quite often helped out as temporary assistants and of course we bought books there. 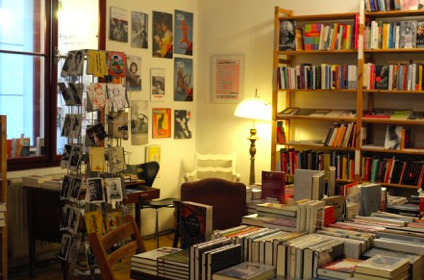 Due to financial difficulties Frauenzimmer had to close down in 2007, which was a severe blow to the Viennese book trade. In 2011 another important project folded – AUF, Austria’s oldest feminist journal, was discontinued after more than 30 years. Things were looking pretty bleak back then. The staff of AUF approached us about saving the journal, and the offices at which it was based. That’s how we acquired our location in one of the few surviving medieval houses in a narrow little street in central Vienna, and came to open a queer/ feminist bookshop. 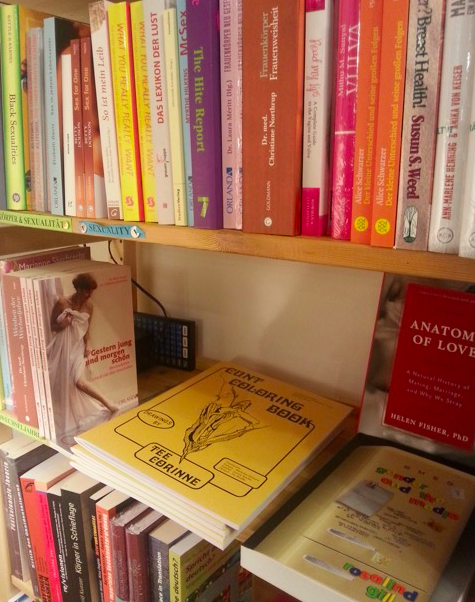 When we first opened the shop in January 2012 the shelves were pretty empty, but our stock quickly increased in size and scope as customers sympathetic to feminist ideas started visiting us. We now have lots of regulars, as well as passing trade. Our customers are a diverse bunch, both men and women, straight and LGBT, students and lecturers at Vienna’s Universities, ex-pats, young adults, people with kids. About one fifth of our stock is in languages other than German, most of it in English. Over the next few years we want to stock more books in other languages, as quite a lot of our German-speaking customers like to read books in their original languages. Every year we’re excited to see the new books our publishers bring out. We also love to see new editions of books that have been out of print for some time, like the books recently republished by Clarice Lispector and Lina Loos. New publications on feminist theory by important authors are also favourites of ours – Sylvia Walby’s Crisis, which published in 2015, comes to mind. When we first opened we sold a lot of books on feminist theory, but nowadays our customers seem to be looking for some escapism, and we sell a lot of novels and autobiographies. At the moment, autobiographies of musicians and other pop culture personalities are very popular – books like Lena Dunham´s Not That Kind of Girl, Viv Albertine´s Clothes, Clothes, Clothes. Music, Music, Music. Boys, Boys, Boys or right now Hunger Makes Me a Modern Girl: A Memoir by Sleater-Kinney’s Carrie Brownstein. As for novels Chimamanda Ngozi Adichie is clearly top of the bill. Americanah (2013), Half of a Yellow Sun (2006) and Purple Hibiscus (2003) are widely read in the English original, but their German translations also sell pretty well. I’ve just finished Andrea Stefanoni’s Die Erinnerte Insel (Septime Verlag 2016), translated into German from the Spanish original ‘La abuela civil española’ (in English it’s called The Spanish Grandmother). It’s set in the Spanish Civil War and Stefanoni explores the effects of war and persecution and how these terrible ordeals of incarceration, torture and flight can often be dealt with in families generations later. Nowadays – with war, flight and expulsion happening day by day on a large scale – I find this very moving. Of course I also have a big pile of books waiting to be read – next I’ll probably pick up something a bit lighter, like Miranda July’s The First Bad Man. 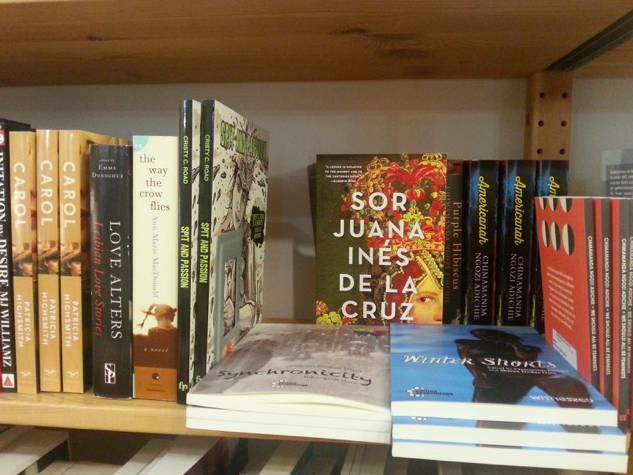 We spoke to Paula, one of the co-owners of ChickLit. ChickLit is at Kleeblattgasse 7, 1010 Vienna, Austria.